Telephone: +44 300 303 1813. Telephone: +1 201 420 9910. For alpine diversions there's nowhere better than the Tatras. Zakopane is a centre for climbing and winter sports where a fairy-tale atmosphere pervades with its "gingerbread" wooden cottages – some inhabitants still wear traditional goralski (highlander) dress. Visit the beautiful Kościeliska Valley, Mount Kasprowy Wierch and the emerald-green glacial lake Morskie Oko. The spectacular Wieliczka Salt Mine, located just outside Cracow, is one of Poland's premier tourist attractions. Built in the 13th century, the UNESCO-listed site boasts 300km (186 miles) of shafts and tunnels, which are festooned with statues and chapels hewn out of salt by miners. Just 2km (1.2 miles) of the mine is accessible to visitors and the tourist route takes visitors 135m (445ft) underground as it passes through impressive chambers, with bas-reliefs, chandeliers and a chapel sculpted. The primary entrance into the Old Town, the Cracow Gate is considered to be the landmark symbol of Lublin. Built in the late 14th century and remodelled in 1782, its tower of red brick was part of the original city fortifications. It also houses a historical museum. 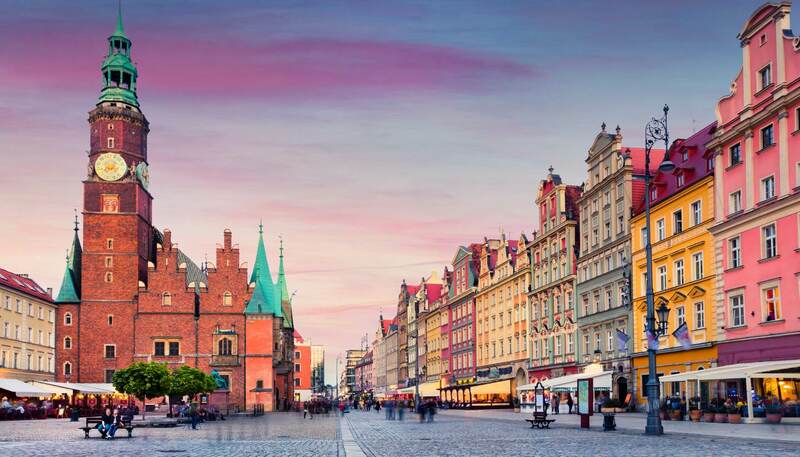 Gdańsk is home to the largest Gothic church in Poland, St Mary's Basilica, while the beach resort at nearby Sopot has the Molo, Europe's longest pier at 515m (1700ft). Within easy reach are the forested Hel Peninsula and beach, the Kashubian Lakeland, and the Teutonic castles at Malbork and Gniew. There are few things more inspiring than a march through Poland's national parks and nature reserves. Hikers should visit Kampinos National Park near Warsaw, while the Bieszczady National Park, part of the Carpathian Mountain, contains the surviving fragments of the Great Bieszczady Forest, home to lynx, wolf, wildcat and up to 120 brown bears. Going for a long meandering walk in the woods to pick mushrooms in the early autumn is a great way to spend a day in Poland. In fact, mushroom picking has been a Polish tradition for centuries, and many delicious varieties exist in the country. Just be sure to go with an experienced mushrooms expert. Poland boasts some of the very best beaches in northern Europe, especially the resorts along the Pomeranian coast, such as large and fashionable Kołobrzeg or Łeba, whose beach is of fabulous white sand. The beach connects to the Słowiński National Park, known for its giant "wandering sand dunes" which can shift several metres each year. The victims of the Holocaust are remembered at Oświęcim-Birkenau (Auschwitz-Birkenau) concentration camp, now a state museum 66km (41 miles) from Cracow. Visiting is a sobering experience, but helps give you perspective on one of history's darkest periods. A walk through the Warsaw Rising Museum is an educational and interactive experience that anyone interested in Poland's World War II history should not miss. The museum features films, testimonials, slides and artefacts from the war when Warsaw residents were active in the resistance. The Masurian Lake District, consisting of over 1,000 lakes, is a favourite angling and boating destination. A popular trail can take you past several lakes and canals. Local towns such as Mikołajki and Giżycko host sea-shanty festivals and other lively events. Białowieża National Park is the last major refuge of the European bison as well as being home to many other rare forest-dwelling species, and trees up to 500 years old. Nature trails, cycling and exploring with a ranger are on offer. You'll immediately feel the charming medieval atmosphere of UNESCO-listed Cracow, one of Europe's most significant historical sites. In the middle of the main market square (the largest in Europe) is the Cloth Hall, which dates back to 14th-century. There's also the fascinating former Jewish quarter and its 16th-century Remuh synagogue, Wawel Castle and the Gothic cathedral. Great bars and restaurants abound. A horse-drawn sleigh ride is a magical experience, though be sure to have either warmed beer or heated honey vodka afterwards. Snow falls throughout Poland during the winter months so these types of rides are on offer all over the country, but principally in the Tatras at Zakopane. Although much of it was destroyed during World War II, the Polish capital of Warsaw still deserves your attention. The Old Town was so masterfully reconstructed from original plans and paintings from the 17th and 18th centuries that it's hard to believe it's just a half a century old when you stroll its quaint cobbled streets. For an unforgettable view of the city, take a lift to the observation deck atop the Palace of Culture and Science, one of Warsaw's architectural icons. The Icon of the Black Madonna, also known as the miraculous painting of Our Lady, can be seen in the huge Jasna Góra monastery complex at Czestochowa, 100km (60 miles) north of Cracow. It is reputed to have been painted by St Luke. The Renaissance-style market square in Zamość with its almost perfectly preserved 16th-century town centre is just one of the many designated UNESCO World Heritage sites in Poland. The stunning Old City was built by architect Bernando Morando, who followed Italian models of the 'ideal city'. The manor house where the famous Polish composer Frederic Chopin was born in Żelazowa Wola, 53km (33 miles) west of Warsaw, makes for a great day trip. Attractions include attractive gardens, summertime recitals and 19th-century instruments and furniture used by the great man. The medieval walled town of Toruń is one of Poland's best sights. The well-preserved Gothic treasure straddling the mighty Vistula river is made up of quaint cobbled streets, redbrick houses and old fortifications. Also Copernicus was born here, as was the special pierniki gingerbread loved throughout Poland. Known as Breslau in German and long a part of the German Empire, Wrocław is a diverse city. Visually, it's unique, with some 100 bridges crossing canals or connecting the city's many islands. Important sights include the 15th-century town hall, now the City Historical Museum, the giant Racławice Panorama, and the cathedral on Ostrów Tumski (Cathedral Island).